Green living is all about avoiding products and practices that damage the environment. Commercial cleaning products are loaded with chemicals that have negative effects on the atmosphere as well as the water supply. If you have kids or pets, you're probably also concerned about the danger these chemicals pose to them. Many of the safest and most effective cleaning products can already be found in your Springs Apartments home. Here are some of the top natural cleansers along with ways to use them. Vinegar is the superhero of natural cleansers. Its high acid content cuts through some of the most difficult messes like grease and soap scum. Mix one part vinegar and one part water in a spray bottle for a tub and shower cleaner. Add a few drops of essential oils if you want a more pleasant smell. Use pure white vinegar to eliminate mildew stains. The vinegar/water solution also works for kitchen countertops and ovens. To clean and deodorize your garbage disposal, pour one cup of vinegar into an ice cube tray and top it off with water. Toss the frozen cubes down the drain and let the disposal run. Ditch expensive liquid fabric softeners and dryer sheets. Add 20 to 30 drops of any essential oil to one gallon of white vinegar. Use 1/3-cup per laundry load. Baking soda's texture provides a gentle scrubbing action that won't damage surfaces. Clean and deodorize the toilet by pouring in 1/2-cup baking soda, 10 drops tea tree essential oil and 1/4-cup vinegar. Scrub away residue as the mixture bubbles. Use 1/2-cup baking soda followed by two cups boiling water to unclog a stopped drain. Remove stubborn food stains from the refrigerator by wiping it down with 1/2-cup of baking soda added to a bucket of hot water. Like vinegar, lemon juice has an acidity that cuts through grease and dirt. It also smells wonderful! Sanitize a cutting board by rubbing a lemon half over it and allowing it to sit for 10 minutes before rinsing. This works for wood and plastic boards. Add a teaspoon of lemon juice to dishwashing detergent for supercharged cleaning power. Make quick work of grout stains with a paste made from lemon juice and cream of tartar. Use a toothbrush to apply, then rinse. In addition to its heart-healthy properties, olive oil has valuable cleaning and lubricating benefits. Remove automobile grease or paint from your hands by washing them with one teaspoon olive oil and one teaspoon salt or sugar. Bring the shine back to wooden furniture with a polish made with two parts olive oil and one part lemon juice or white vinegar. Apply with a spray bottle and wipe with a clean terry cloth. Silence a squeaky hinge by spraying olive oil on it. Remove excess with a cotton ball. 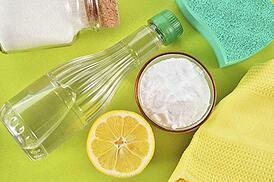 Do you have other natural DIY cleaning products to add to this list? Let us know in the comments!